A movement to end violence against women. When people make sexist or degrading comments or jokes about women, it can be hard to speak-up. We might tell ourselves that these forms of everyday sexism are harmless, that they are just words, or ‘just a bit of fun’. But research shows that these comments and jokes and the attitudes they reinforce actually drive violence against women. Even if people who make these comments are not violent, this kind of disrespect contributes to inequality between women and men, and it is now recognised that gender inequality is the root cause of men’s violence against women. Try this informative quiz – How would you call out a mate? The evidence is in, and it shows that disrespect towards women is a key driver of men’s violence against women. It also tells us that taking action to challenge sexist or gendered stereotypes and strengthening equal, respectful and positive relationships between men and women are essential actions to take, to prevent men’s violence against women. Challenging everyday sexism is fundamental to creating the cultural change needed to eliminate violence against women. It makes a HUGE difference! Take a look at these video resources, you can use them a conversation starter to introduce the concepts of bystander action into your workplace or organisation. Print out and display this poster at work, school, your community space, or anywhere, to help other people understand the link between sexist comments and violence against women. You can also print display this poster, to help others understand the actions they can take, in their everyday lives, to reduce sexism, promote gender equality and prevent violence against women. Please note that these clips/articles contain information regarding the topics of sexism, gender inequality and violence against women. If you find the information distressing, please click through for information and support on self care. If you or someone you know is experiencing violence, please visit the our help section for further information and support. 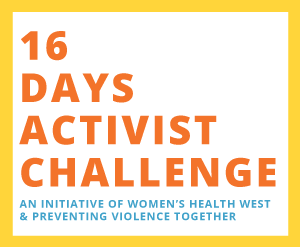 The challenge is led by Women’s Health West, as a regional initiative for the Preventing Violence Together partnership.